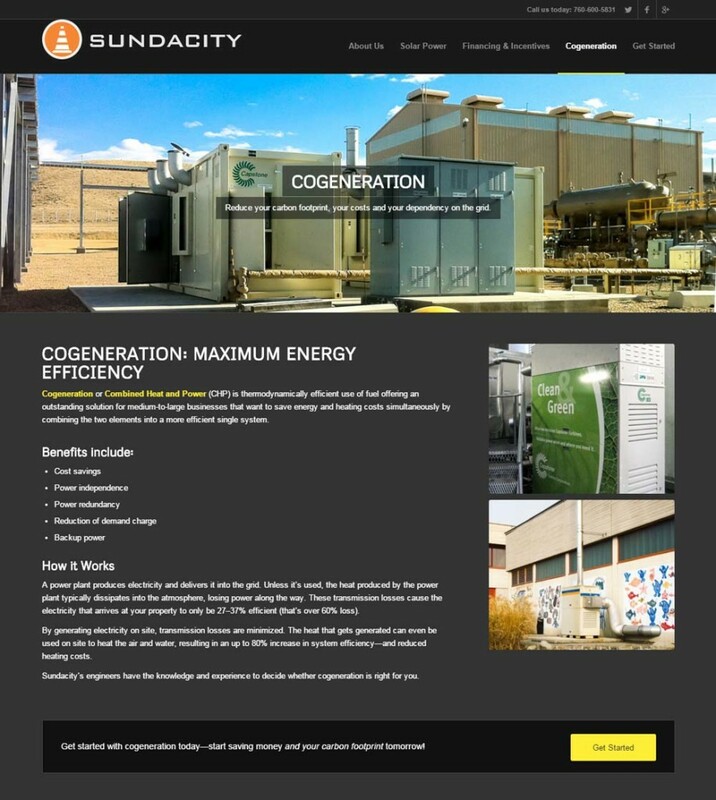 Goal: Create an entirely new website that reflects Sundacity’s state-of-the-art techonology, with a clean, easily navigable user experience and clear calls to action. 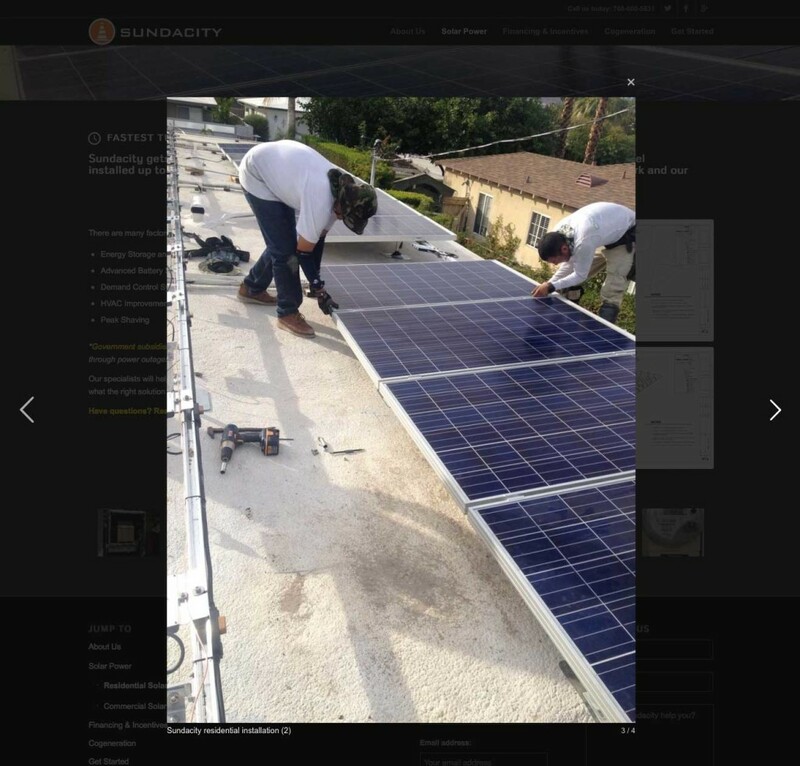 Sundacity is a solar power and alternative energy provider, focusing on providing quality, affordable solar energy to residential and commercial customers in Southern California. 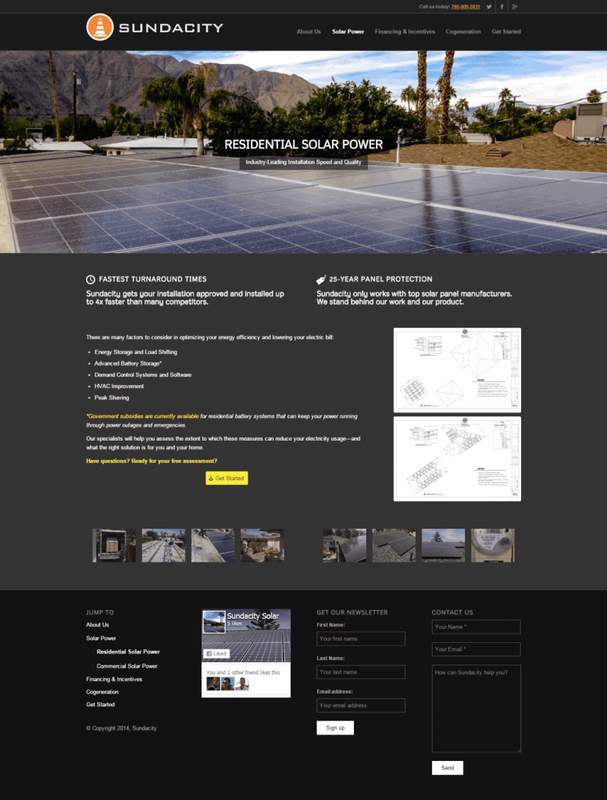 They are a growing company in a highly competitive field, so they needed a website that matched their vision and marketing needs. Beyond a visual representation, a website must tell the business’s story—what makes them different from every competitor. 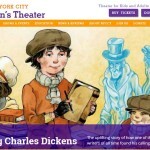 Speed of Like worked with Sundacity to refine their messaging and their market differentiation. Unlike many other players in this industry, Sundacity works with a number of technologies and financing options to truly deliver the best value for the homeowner. 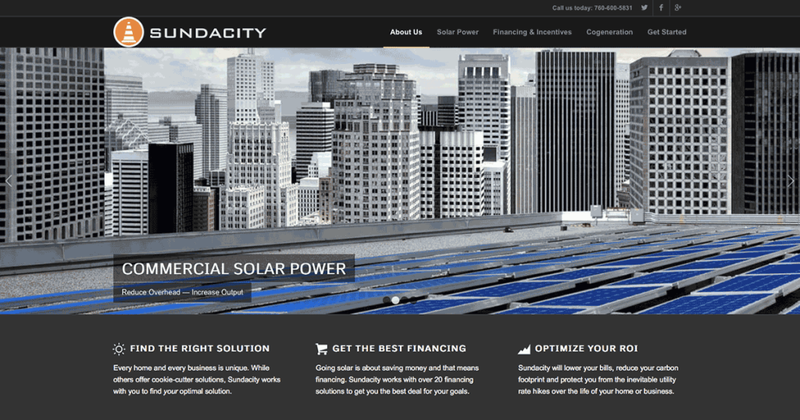 Working in a field that relies heavily on technology and innovation, Sundacity’s website had to reflect their cutting-edge philosophy. 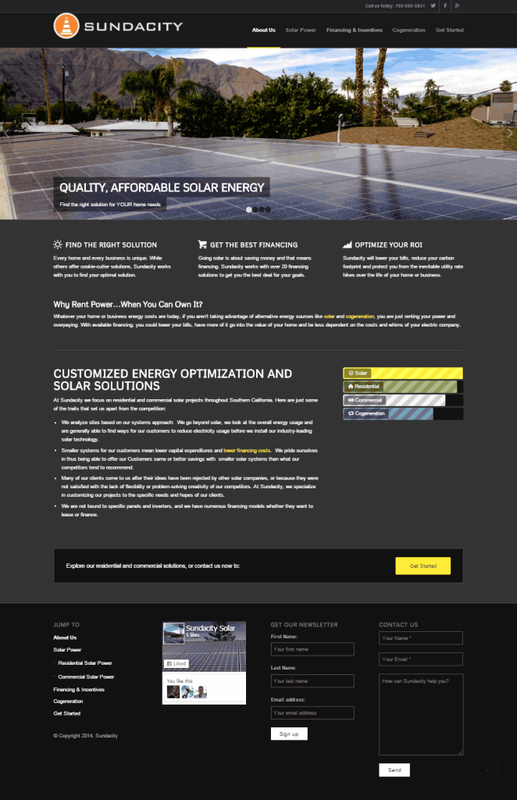 Speed of Like within Sundacity’s established branding and color schemes, developing a custom look and feel, with interactive visuals and dynamic elements throughout the site that enhanced their identity as a premiere solar energy company. Gave site visitors the information they need to commit to taking action, whether that’s going to another page, subscribing to the email list, or requesting a consultation. Speed of Like researched and created informational visuals—including photos, statistics and graphics—to tell the story and show off their strengths, helping convert site visitors into leads. 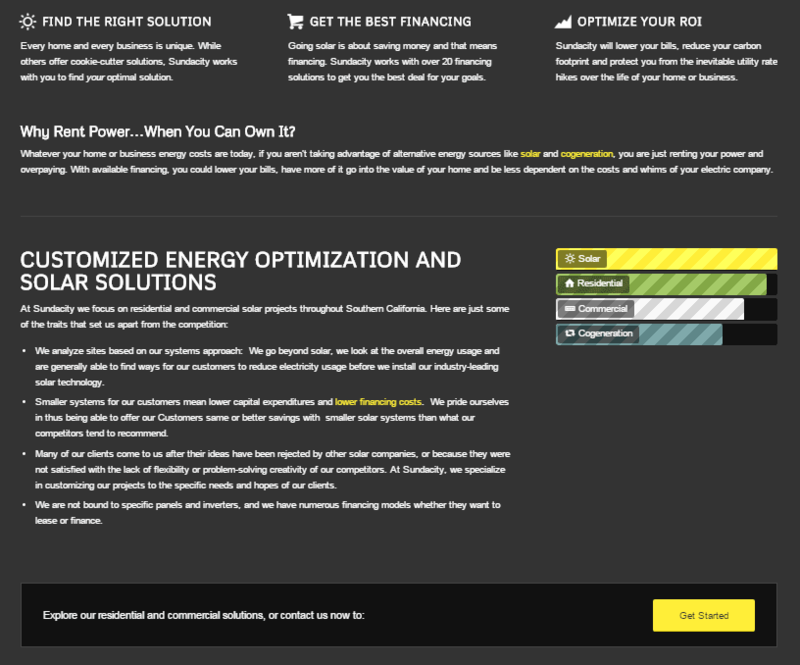 Clear calls to action were added to every page to drive inquiries in Sundacity’s target markets. “Speed of Like handled everything in absolutely professional manner: Your response rate has been outstanding. Your ability to address any issues that came up in the design process is without comparison. The new design has received excellent response from our customers! We will be more than happy to refer your services to anyone who is looking to create or improve their website.